American singer Denise Mininfield's second tour of Vietnam will take her to the country's four largest cities beginning tomorrow, according to the US Consulate in HCM City. Mininfield will rejoin Vietnamese saxophonist Tran Manh Tuan, whom she performed with in 2004, and other top Vietnamese jazz musicians tomorrow at the HCM City Opera House. She will then travel to the central coastal city of <?xml:namespace prefix = st1 ns = "urn:schemas-microsoft-com:office:smarttags" />Da Nang for a concert at the Trung Vuong Theatre on Saturday. Mininfield will also conduct workshops on stage performance and the history of jazz at the HCM City Conservatory of Music and the Da Nang College of Foreign Languages. She will also stage concerts and workshops in Hai Phong on January 29 and 30 and Hanoi on January 31. Born in Berkeley, California, Mininfield began playing music as a teenager with her award-winning Berkeley High School jazz band and went on to study music in university. 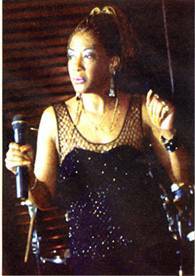 She sings in a broad range of styles from rock and roll and R&B to classical and jazz.